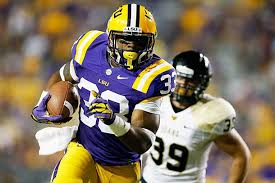 Jeremy Hill: Juggernaut or Blob? If you follow the draft community on twitter or anywhere else on the internet, many people are warming up to the red-shirted sophomore running back Jeremy Hill. I decided to take the afternoon to watch four of his 2013 games against Arkansas, Auburn, Florida, and Mississippi State to see what the #draft-twitter excitement was all about. Before I get into what I saw on tape, Hill does not have very impressive intangibles. There were some accusations of sexual misconduct in high school with a 14-year-old that caused him to enter college a year late. He punched a fellow LSU student out at a local college bar last spring. Perhaps Hill was an immature guy and has grown out of this kind of behavior. Only NFL teams will get a good grip on that with the several interviews each team gets with him starting at the Combine this coming weekend. Dynasty owners will have to make their decision partly based on which NFL team takes him, either a team with issues such as the Dolphins or a strong locker room like the Patriots. From the first minute of tape, it is clear to see that Hill is an explosive athlete who has good burst and acceleration. He is a very powerful, downhill runner. The other thing that is quite clear is that while he reads his blockers movements near the line of scrimmage, the back does not have the necessary vision to see more than five to ten yards down the field. This causes the runner to not get to the second level when the rest of his team doesn’t get a hat on a hat. Hill has decent balance despite running a bit too high. If he wants to be a better inside runner, he needs to get behind his pads and deliver punishment instead of just receiving it. There were too many times that the defender was the low man in the hole and Hill let the defender into his body which caused him to slow down and at times get tackled too early. It is much harder to keep defenders off your body when you are 6′ 2″ than when you are five to six inches shorter. Hill runs with power and keeps his feet churning until the whistle blows. In the hundred plus carries I watched, he got knocked back less than ten times as he constantly fell forward for extra yardage. The back will punish defenders with a nice stiff-arm and tries to deliver as much punishment as he takes. He isn’t tentative in the hole and will take what yardage is available. The young back reminded me a bit of Marcus Allen in the open space, but unlike Allen, Hill also had his share of ugly-looking runs. He does have great breakaway speed and looks amazing in space as I watched him break four or five 50+ yard touchdown runs to the outside. The back puts his foot down and streaks down the field. It’s a combination of his quick feet and lateral quickness that helps set up the runs in the open space. Hill can start and stop his body with the best of them. Unlike most backs though, he cannot create his own space in tight spots because of his poorer than average vision. His unlimited athleticism is scary though. This man can hurdle over a defender, use a jump cut or a spin move to avoid the tackle, but will simply get caught up in the trash at the line of scrimmage. Once he gets the momentum, he is more difficult to get down than the X-Men’s Juggernaut. The back is a more accomplished outside runner, but he can mix it up running between the tackles if he has a good o-line in front of him. When he needed to, the runner could get small in the hole, only to squirt out for a huge gain. Hill also shows rare hustle as he is always looking for the run to the house and sometimes ignores the first whistle after being brought down, gets up, and streaks towards the end zone. The back has long arms with decent hands and can make difficult receptions with defenders draped all over him. He looks good on swing out passes and wheel routes with his quickness and body control to adjust to the ball in the air. I am concerned that he body catches almost everything as this limits his ability to break passes wide open as he has to concentrate on making the catch before he runs with the ball. Hill is not a back without problems though, outside of his off field issues. The back is a very inconsistent pass blocker, sometimes he gets in a blitzer’s face cutting them off from the quarterback, and at other times he would simply whiff making no contact whatsoever. This limits his use in an offense to start his NFL career as he cannot be trusted to help pass block. Ball security is another concern as Hill seems to carry the ball away from his body. He looks like a young Tiki Barber out there holding the ball like a loaf of bread. I would think that a coach of Les Miles caliber would have tried working with him on that concern though. The young back also has a tendency to leave his feet for less than ideal situations. If it’s the difference between scoring a touchdown or gaining the first down, it should be commended. However, Hill seems to leave his feet just to gain extra yardage and take more punishment than is necessary. Every back only has some many carries in them. At the time of this writing, I have Hill in my top three rookie running backs and in my top fifteen overall rookies. Much of his value gets determined by where he ends up, not only for the potential fantasy production aspect, but also the environmental factors that will shape him as a man. For further questions or comments, please contact me on twitter @AndrewMiley or @Dynasty_Blitz. If you liked the article, tell a friend or better yet buy my a beer or a six-pack using the Paypal button on the front page.